CHARLESTON, WV — Today, U.S. 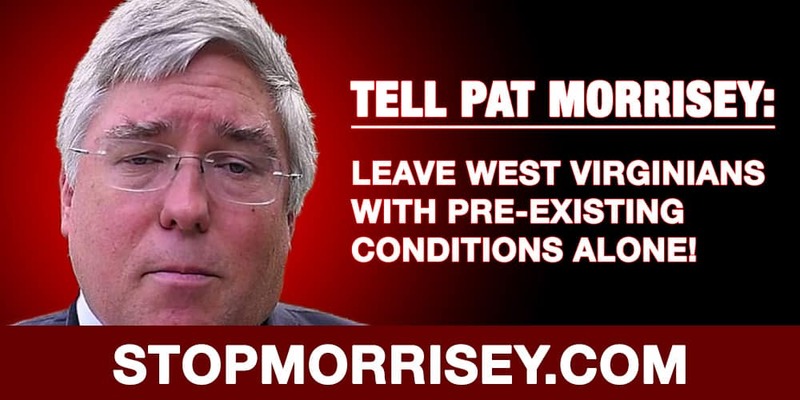 Senator Joe Manchin’s campaign announced that 2,000 West Virginians signed an online petition to tell Attorney General Patrick Morrisey to stop attacking people with pre-existing conditions. The people of West Virginia are speaking out by signing the petition online at www.StopMorrisey.com. West Virginians are angry that Morrisey joined a federal lawsuit to allow insurance companies to deny coverage for people with pre-existing conditions. Just read the letter from Robert Edge in Bridgeport, WV published in the Exponent-Telegram, or the letter from Whitney Wheeler in Morgantown, WVpublished in the Dominion Post. If Morrisey has his way, hundreds of thousands of West Virginians could be left to decide between taking on crushing medical debt, or simply going without treatment.